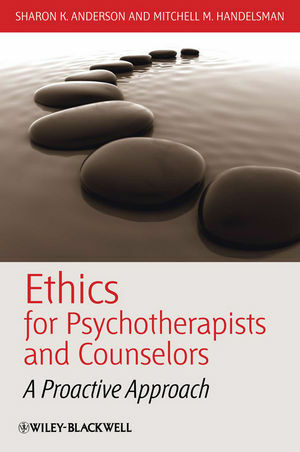 Ethics for Psychotherapists and Counselors utilizes positive discussions accompanied by a variety of thought-provoking exercises, case scenarios, and writing assignments to introduce readers to all the major ethical issues in psychotherapy. Sharon K. Anderson received her Ph.D. in counseling psychology from the University of Denver. She is a licensed psychologist and has taught in the master’s-level counseling program at Colorado State University since 1994. Mitchell M. Handelsman received his Ph.D. in clinical psychology from the University of Kansas. He has taught psychology at the University of Colorado Denver since 1982. He is a licensed psychologist and a Fellow of the American Psychological Association. 2. Basics of Awareness: Knowing Yourself. 3. Basics of Awareness: Privilege and Social Responsibility. 4. The Process of Acculturation: Developing Your Professional Ethical Identity. Part Two: The Nuts and Bolts of Psychotherapy Ethics. 5. The Ethical Culture of Psychotherapy. 6. “I Can’t Believe It’s Not Therapy!”: Boundaries of the Psychotherapy Relationship. 7. Confidentiality: A Critical Element of Trust in the Relationship. 8. Informed Consent: The Three-Legged Stool. 9. Making the Most of Supervision. 10. Ending Psychotherapy: The Good, the Bad, and the Ethical. Part Three: The Ethical Ceiling. 11. Putting It All Together: Toward Ethical Excellence. Appendix A: Possible Information to be Shared With Clients.